When you’re in your early 20s, eighteen months is a helluva long time, but that’s how long it took us to come up with a follow-up for White Night. Of course, there are all kinds of reasons, but mainly, Pete and Hywel having drifted away, me and Jo felt like checking out of the musical monastery and just living for a while. We both went off traveling with our girlfriends, he to Turkey, me to California, and absorbed many influences that were to surface in our subsequent work. When we reconvened in the Spring of ’79, in a newly Tory-fied Britain, some momentum had built up around White Night. It had been re-released on Illegal Records, a sister label of Step Forward and Deptford Fun City, which were run by Miles Copeland III with Mark Perry and others (and would ultimately conglomerate as I.R.S Records). It had a very nice picture sleeve, the first to feature an image by our good friend and co-conspirator, artist/ photographer Martin Mossop. Jo and I started playing again and were soon joined by one Nicholas Cash on drums. A St Martin’s graduate and a gifted visual artist, Nick’s first love has always been pounding the skins (or electronic pads), for as many people as he could possibly make time for. At the time he joined us he was also a member of the excellent Prag Vec and was starting to play with a mate of his named Frank Tovey. Nick had attended our first gig in Highbury in 1977, and we had been friends since, so we were more than happy that he wanted to join us. During my travels I had kept a guitar nearby and spent some time working on new material, and honing down old stuff. The first three songs that were prepared for recording were rather in the honed category: On The Air contained elements of early Lines songs Clone Zone and Howard Hughes (His Body Betrayed Him). Lyrically it’s probably one of my best songs, a description of a “series of dreams”. The arrangement still contained many elements of White Night and Barbican: guitars playing on the eighth note, a melody floating over zigzag chords…no guitar solo though. And there was a whole new energy level, which had a lot to do with Mr Cash. There was a character working at Step Forward by the name of Steve Brown. I was immediately impressed to hear that he was a roadie for Throbbing Gristle; at their rare performances he would help set up the gear and also intercept the bottles and stuff hurled at the band by an inevitably outraged and repulsed audience. He was a Randy California fanatic, I think we may be detecting a pattern here. He left Step Forward and started his own label called Red Records, and asked us to join him. 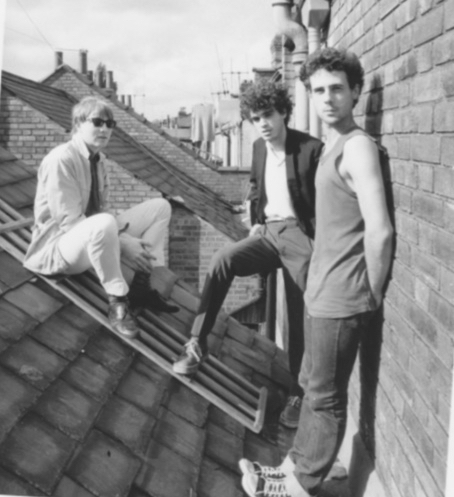 So it was as a three-piece that we recorded On The Air in September 1979 in Camden. I thought it was pretty damn good, but the reviews were mixed. Sounds was nasty as ever. The chap in Melody Maker perceptively pointed out that we were using guitars to play electronic music arrangements. Charles Shaar Murray at the NME called it “a daffy and charming intervention from the neo-psychedelic wing of Modern Chaps United”.